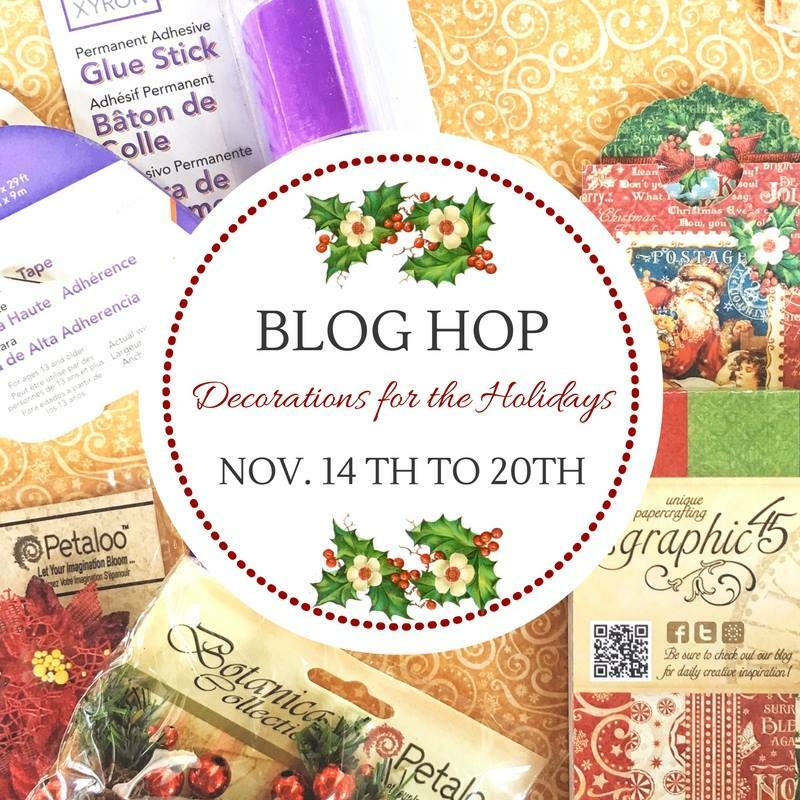 Thank you for joining us for the Decorations For the Holidays Blog Hop... featuring fabulous Xyron, Petaloo, & Graphic 45 products!! I super excited you are here today!! It's all about decorating for the holidays this week!! And we couldn't be happier because it beginning to look a lot like Christmas here!! I wanted to make a small grouping of these candy jars. In groupings, ODD numbers are the key. I wanted to make it small enough to put on display for home decor and big enough to work as a little set up for parties and get togethers (if you have a need for a more prominent display just add more to you grouping, making sure that your end amount is an odd number... 3, 5, and 7 work very well). Don't forget to add varying heights for interest. I start by washing and drying my glass. 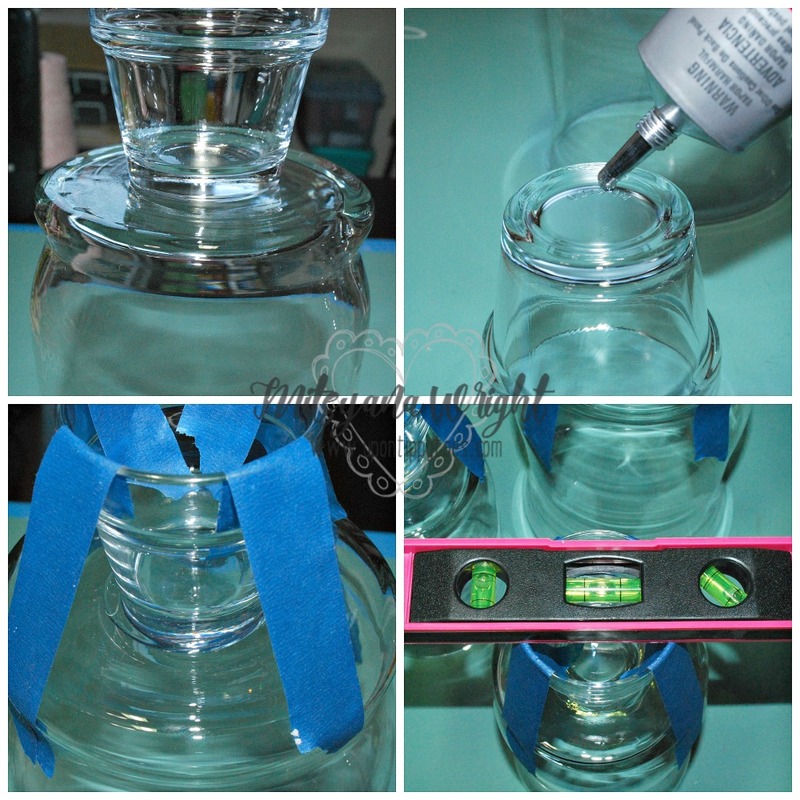 I used flipped the hurricane over and found the center of the bottom using the glass votive. Once my center was found I added E600 to the bottom of my votive and attached it to the bottom of my glass hurricane. I tightly taped in in place with blue painter's tape... using a level to make sure it is leveled. Once dried, I removed the tape. The candy holders are now ready to be decorated! To measure the circumference, I wrapped a piece of burlap ribbon around the neck of my glass. I used this piece of ribbon to gage how much paper I need to go around. Then, cut my paper into strips. 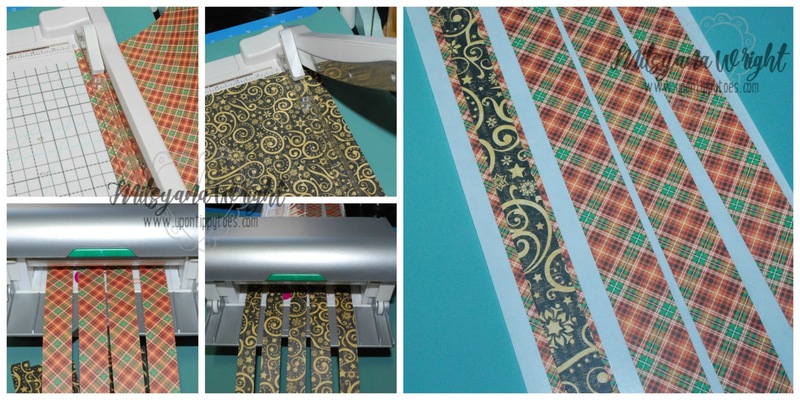 This was 1-1/2" wide ribbon, so I cut my plaid paper 1" wide, then cut the center strip to 3/4". Next, I ran all my strips through my Xyron Creative Station Lite. Peeled. and layered my black patterned paper onto the plaid one. Then, applied the layered strip onto my cut burlap ribbon. I used hot glue to attach the ends of the burlap. There was a gap that was left where the paper ended... It's ok, I covered this area with leaves, berries, and GORGEOUS velvet and canvas flowers. I hot glued each in place and added a multi-looped twine bow. I found these awesome stamp prints in my paper pack... I ran those through my Xyron Creative Station Lite as well, and adhered them to chipboard and added them onto my arrangements. The finished products are gorgeous and I am absolutely in love!!! 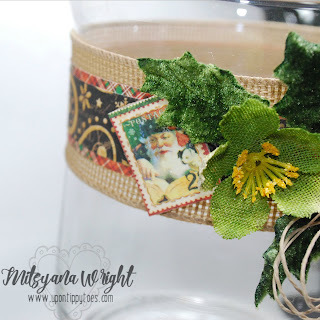 Here's a closer look and these amazing vintage inspired Santa stamps. 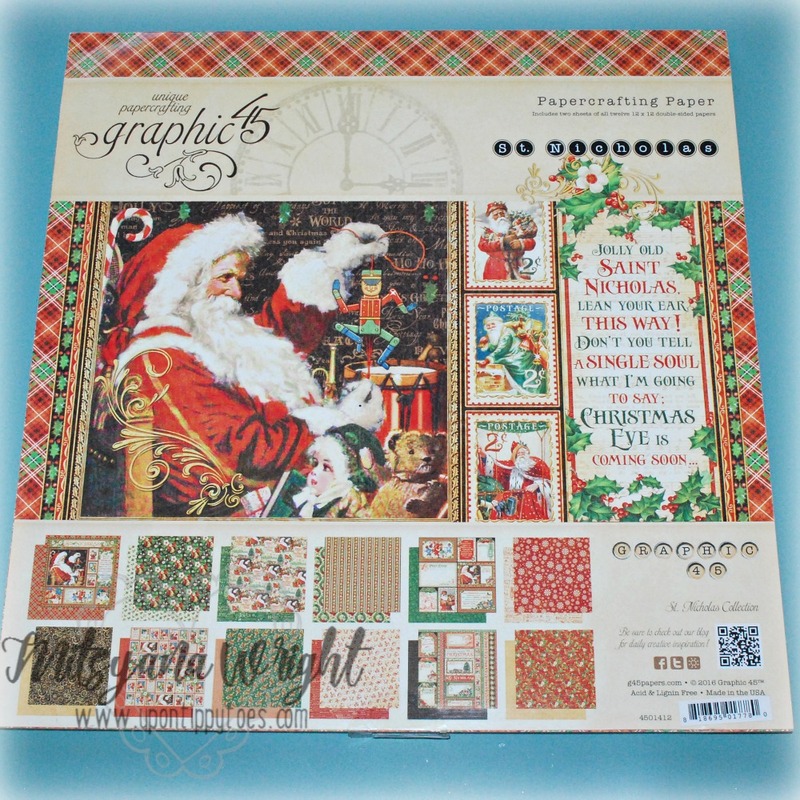 I love how Graphic 45 included several different ones in this pack... and they are all amazing!! They don't just look fabulous empty! OR add your favorite candles!! For safety reasons, always remember to make sure the all embellishments are clear from any open flames and that burning candles are never left unattended. Graphic 45 is doing an AMAZING GIVEAWAY!!! 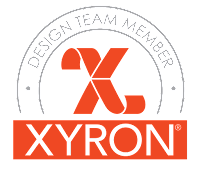 They are giving away $150+ in prizes from Graphic 45, Petaloo, and Xyron. Wow! 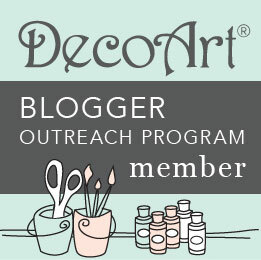 All you have to do is comment here on the blog or on Facebook to win. 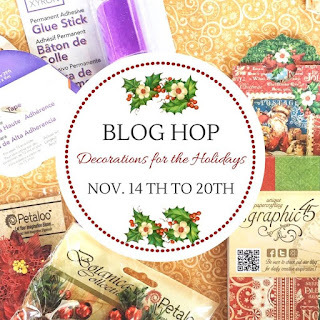 Also, make sure to hop to all the blogs to be entered! We will announce a winner next Monday, November 21, so you have until Sunday at 11:59 PM PST to enter. ..
and LEAVE A COMMENT TO ENTER!! And Best of luck to all!! 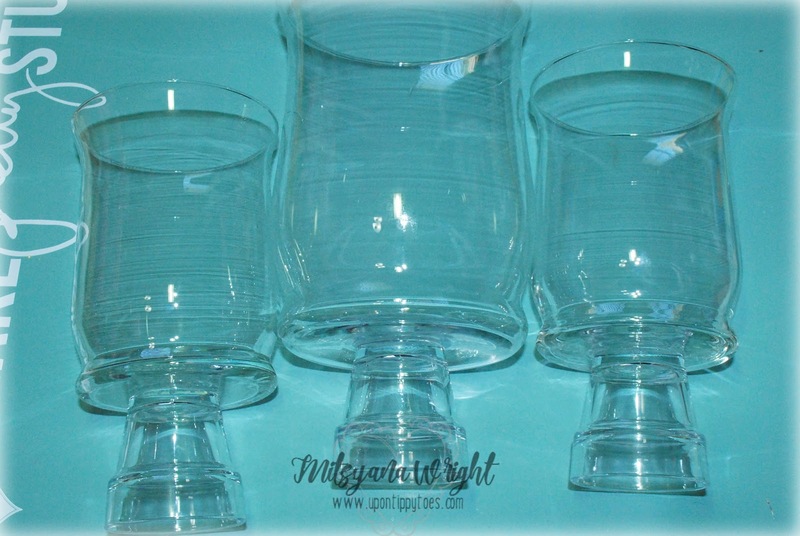 Those vases/candy dishes are fabulous. Very creative. Thanks for sharing the tutorial. These are so beautiful and functional too! BONUS! 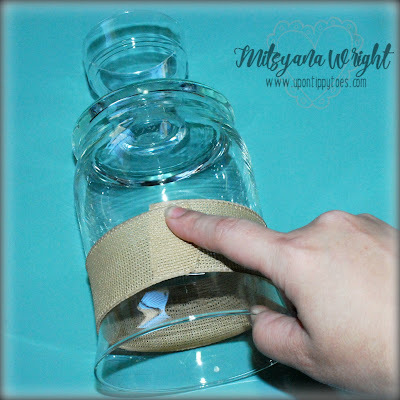 I am definitely going to be getting my hands on some jars like these and follow suit!! Thanks for the inspiration! 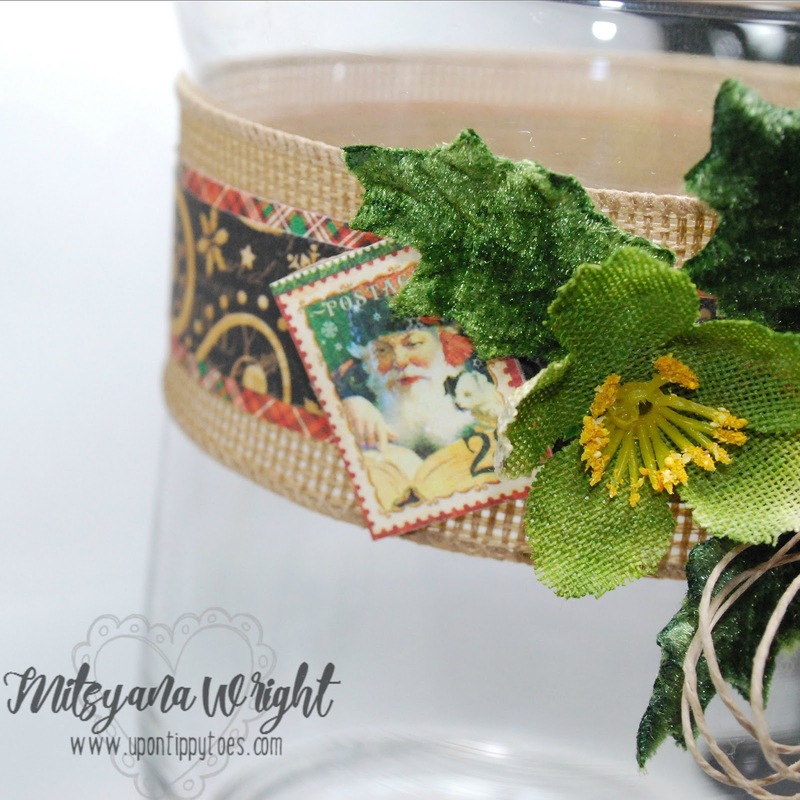 The jars are so quick and easy to decorate, and so beautiful when finished! Oh, I just love this idea! 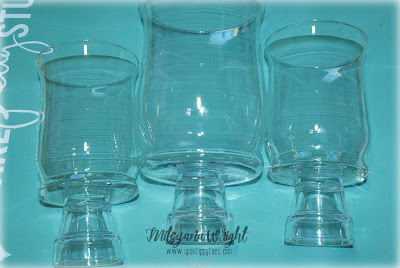 And can't wait to go to my local thrift store to pick up some glass votives & jars like this. These would make an awesome gift, which is what I plan to do. These are stunning with G45 & Petaloo pieces. 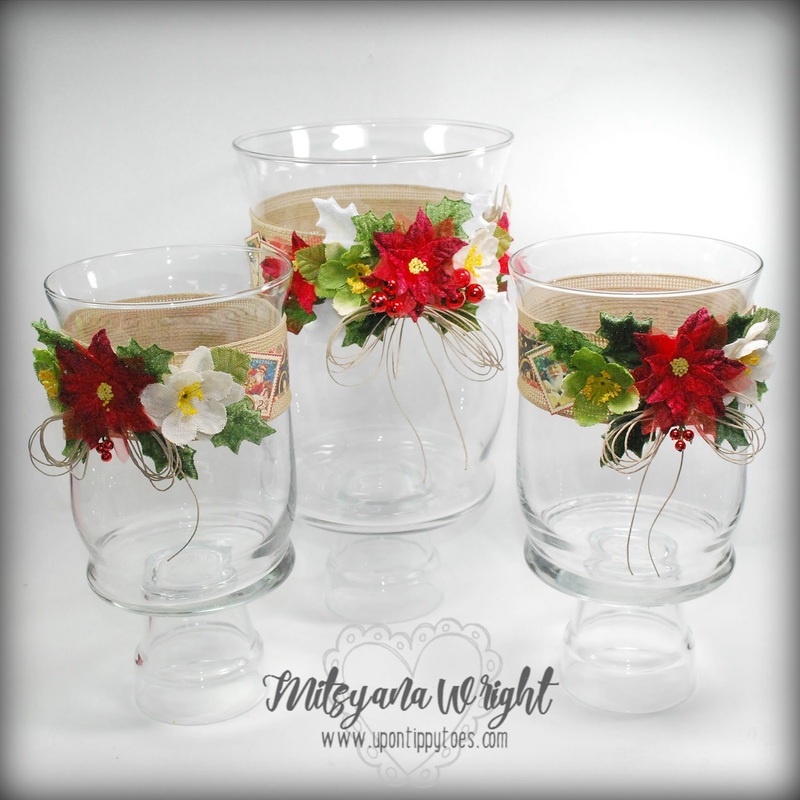 Very pretty and festive candy/candle holders! Oh wow!!! Your project is really awesome!!! Thanks for this amazing holiday DIY!!! 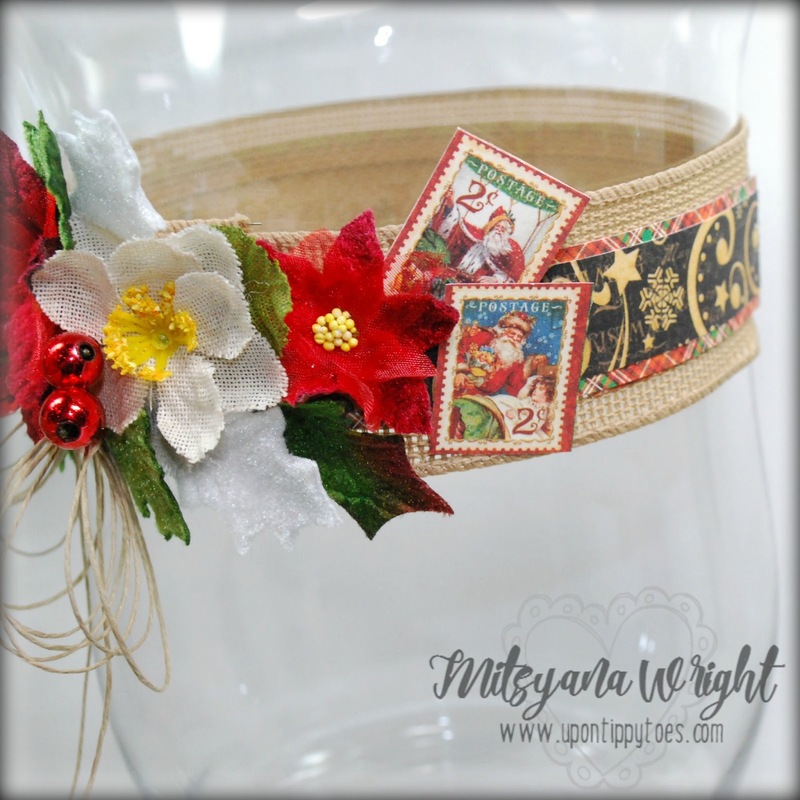 Oh I have so many jars just waiting for a little lovely decoration like this!! These are beautiful! 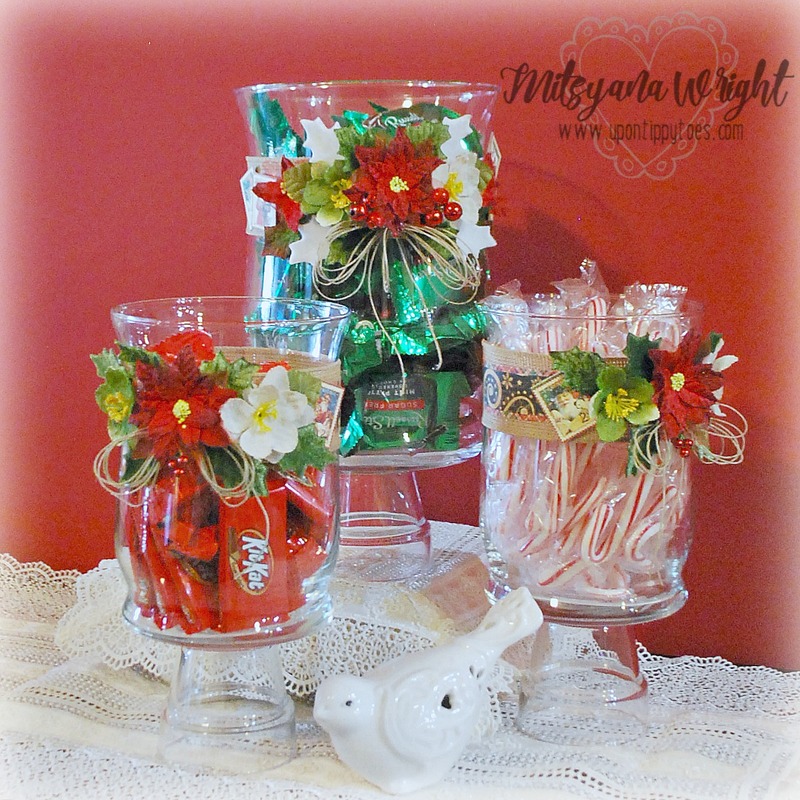 They would be a great gift idea, filled with some homemade candies! Those are pretty! I like the idea of candy jars or candle holders. These are so pretty!!! 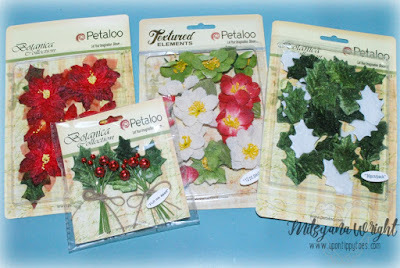 I'm super inspired by your beautiful project and can't wait to get supplies and try this too!! Absolutely gorgeous and thanks so much for sharing your wonderful talent for this special hop! Love, love your beautiful idea. Thanks for sharing. Awesome project! Would make great centrepieces but I would probably fill mine with candies! I have 3 battery light mirror glass mason jars. I intend to use your inspiration to decorate them. They will make fabulous gifts for some friends. Thank you for the gorgeous inspiration and the great how-to! Oh yum! 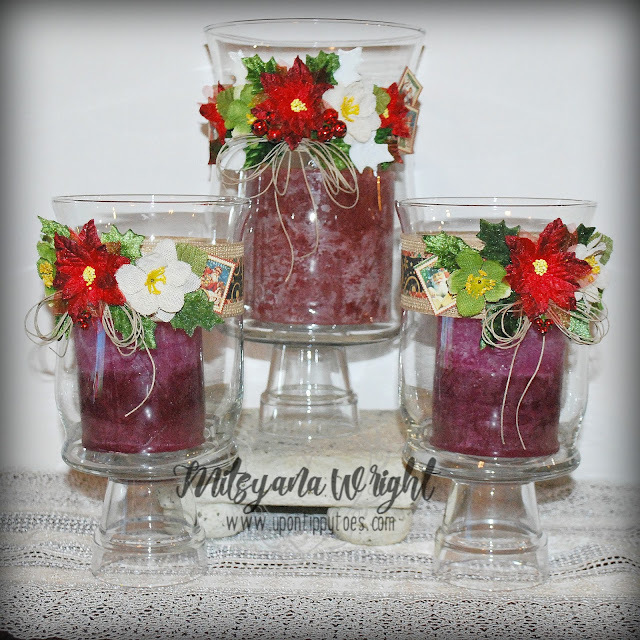 I have a variety of glass candle holders, vases, and jars that are just waiting to be decorated like this - thanks for a wonderful idea! 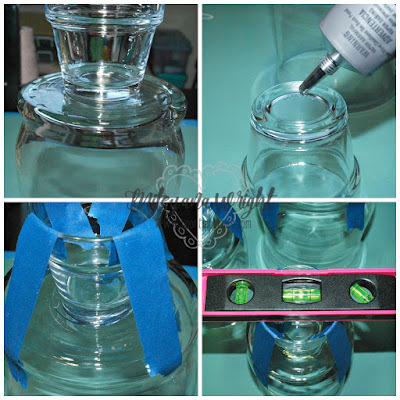 Love how you dressed up those jars for either candy or candles. Simply beautiful. Thanks for sharing. How utterly fun and stunning! 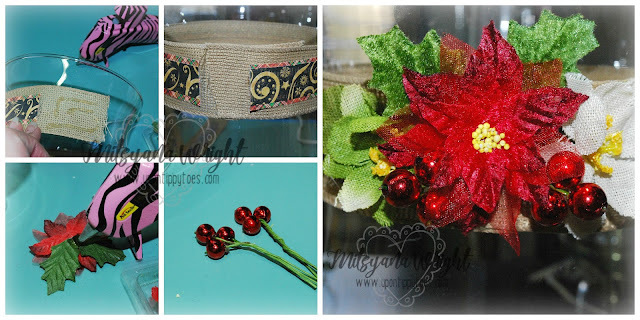 You can turn this is to a solid centerpiece for Thanksgiving or Christmas--depending on the embellishments! Thanks for sharing!